Mountable Blades - brings the quickest removal. Their angle is usually adjusted with a pin or a lever. With the discharge angle fixed: starting down the center one way, and returning the other, allows the blade to be kept in the same position while working outward until the driveway/parking lot sides are reached. Those with auto adjust angles have greater freedom. Noting that, as the sides tend to build higher, as from repeated plowings, pushing the side walls back (with slightly raised blade) onto the lot and from at an angle can help prevent infall and the closing-in of the borders. Usually the blade is equipped with a pair of skids, one at either of the sides that the blade rests on while lowered. These keep the wear off the blade itself and maintain the desired pressure. Since skids wear, and as they do bringing the blade nearer to ground, they will need adjusting if this is a choice prior to replacing -- considering, any uneveness, such as from one slab section to the next, that may actually knock the scraping blade (potentially resulting in chipping). Grader attachments, on the other hand, are pulled from behind and this 'after' the wheel tracks. Grader blades are commonly at a lower height than push blades. Diesel tractors have the stronger pull with four wheel drive. Traction - given that the surface has a deposit of snow, and possible ice, the better the traction the better the removal. If your vehicle is a four wheel dirve, such as a larger tractor, bringing greater traction normally isn't needed but for smaller lawn tractors taking a blade, rear wheel weights might be recommended assuming the tractor can accomodate, such as many John Deer versions. Weights simply bolt on from available openings in the rear rims. Chains might be another option, however, chains can cause damage on certain surfaces; particularly ashpalt, but even to concrete drives (lower psi-rated concrete). Paddle Blowers - these are the compact versions. Most effective on short, narrow walks, especially where the snow pack is light or the user of modest means. Spindle Blowers - the spinning discharges considerably. Many are self-propelled with levered chutes that turn from where you are, for a change of directions. Consumer models aside, the more staut blowers are adept at making things happen. Round Shovels - these shovels blades are designed for pushing and they are best used on straight areas. Shallower snow. Tapered-Shape Shovels - are best used on higher packs, through steps, platforms, and cut up areas, possibly users with stronger backs given the constant lifting motion involved. Concrete - although it is dense and can handle most heavy trucks coming and going throughout the year, concrete is not the ideal transmitter of ground warmth. This translates to icier times. Even though it's popular to spread salt on it, as well as on other surfaces, the application of salt granules frequently leads to an eventual pitting & surface spalling. Asphalt Paving - a snow will often melt all on its own, due to its warming. Scraping a drive or walk that is asphalt will melt off quicker than concrete. That it is a continuous surface, seamless, means that a plow blade is less likely to 'catch' and chip - although in reality, many aspalt drives may not be as level as concrete -- whether due to settling, lifting from tree roots, or what not, though each surface of course varies. . Timing of Removal - all things considered, the best time to remove snow, given an optimistic forecast, is early to later in the afternoon. 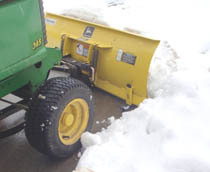 Removing all snow and/or slush is a considered a best practice, to prevent any re-freezing.